There are several possible ways to achieve a rectangular (square) shape in filet crochet. 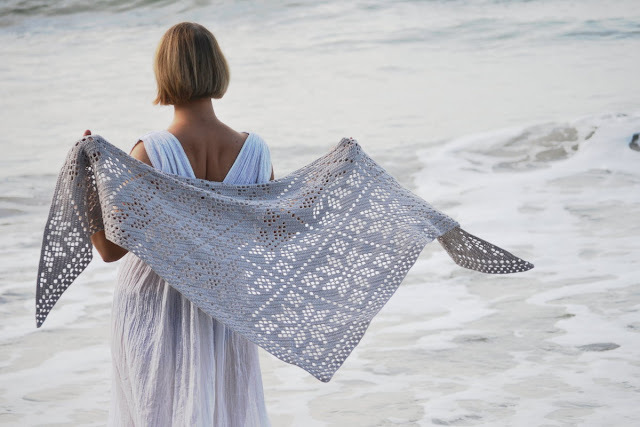 You can start from a corner and crochet a triangle by placing the increases on both sides until you reach the desired width. 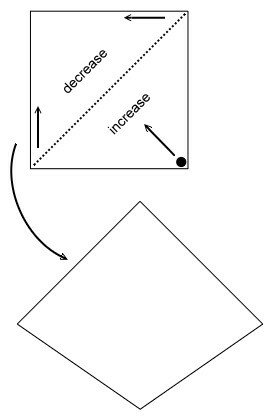 Then, decrease until you get a square (first picture). You can work in the rounds from the center out until you reach the desired size (center picture). Or you can simply work in rows (last picture). The first option is perfect for making triangular filet shawls. I love it very much. It features an easy and quick start and allows you to stop as soon as you reach the desired size or until the end of your yarn. However, your piece will not (in most cases) be perfectly triangular; it depends on your chosen yarn, tension, the thickness and height of dc stitches and the length of chains. To get a perfect piece you have to have all cells perfectly square. In case of shawls, it is not a big problem, on my opinion. You can block your piece and get it nearly perfect. But in case of the square-shaped blankets, such imperfection will be very visible. Actually, you will get not a square, but some sort of a diamond (picture at right). It can be fixed (a little bit) by blocking but not much. Making a pattern for a blanket which perfect result depends on so many factors is not a good idea. The solution which might work for me (like making the chains longer, or switch dc to tr) could not be suitable for a fellow crocheter, who has a different tension or using a different yarn. 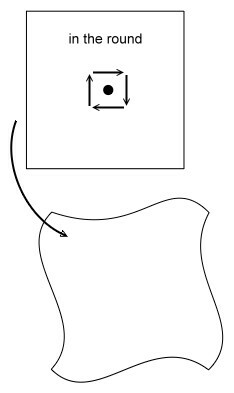 The second option is working in the round, which faces the same problems. Your piece will tighten in the center and have the flared (too wide) edges/sides. 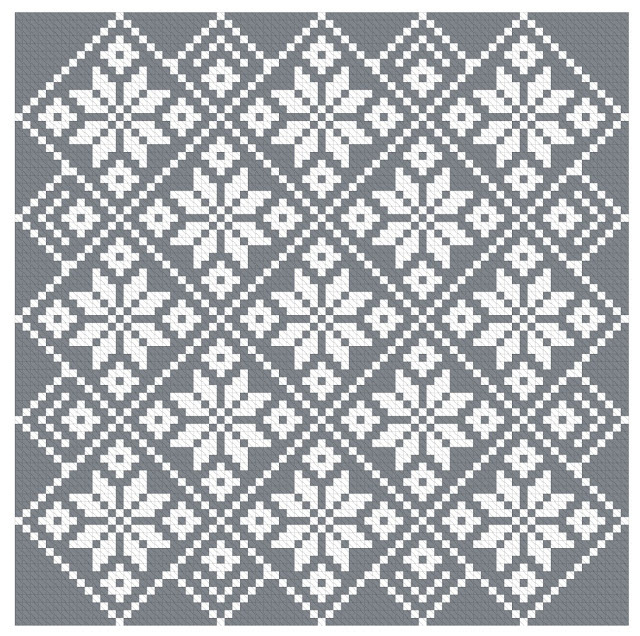 This option works for smaller motifs, but the larger your motif turns out, the more is its deformation. The last option is working in rows. This is the simplest (but boring, maybe :) way of making the large and accurate piece in the filet crochet technique. And it requires much simpler blocking: you have to either stretch your piece in width or make it longer to achieve the square shape. I recommend using the last option since it makes the finished result much more predictable. Here is the filet chart for Zirka blanket worked in rows. Hope you find it useful and it helps you to crochet your Zirka blanket.